Queen Elizabeth's Grammar, Alford believes that all pupils have a right to a broad, balanced, relevant and inclusive curriculum that challenges them to achieve academic and personal success. The academy aims to encourage and foster the development of all pupils. It is our intention to identify any barriers to learning at an early stage and to ensure that provision is put in place for any specific needs or difficulties. To ensure these needs are supported successfully there is a graduated response that includes teachers, parents and pupils. The relatively smaller size of the school is an advantage as it enables us to ascertain the needs of an individual pupil more easily. What should I do if I think my child may have special needs? If you think that your child may have special educational needs that have not been previously identified, you should contact the school to speak to the SENDCo, Mr Mills, (A.Mills@queenelizabeths.co.uk - 01507 462403) or speak to your child's Head of School or the Headteacher, Miss Francis. How will the school respond to such a concern? The person who you speak to initially (this could be Headteacher, Head of School, subject teacher or form tutor) will clarify with you why you feel your child may have special educational needs which are not already identified. This will then be referred to the SENDCo who will gather information from all of your child's subject teachers to gain an overview and also meet with your child to discuss the difficulties they are encountering. All relevant information will be collated and reviewed in order to decide on the appropriate course of action. You will be fully involved in this process and a decision reached as to whether further support is needed. Where can I find the school's Special Educational Needs and Disabilities Policy? How will my child be able to contribute his or her views and how will the school support my child to do this? The views of our pupils are extremely important to us. They are encouraged to monitor their own performance, assisted by subject teachers, parents and other staff who work with your child. All students with a Special Educational Provision Plan (SEPP) or Statement / Education and Health Care Plan will have a mentor, who will meet with them regularly. Your child will be invited to all reviews and be encouraged and supported to discuss their views both orally and through written questionnaires. In addition, they are able to meet with the SENDCo if they wish to discuss any aspect of their learning. How does the school know if children need extra help or have a special educational need? Before pupils join us in Year 7, the Head of Lower School and Special Educational Needs Coordinator (SENDCo) liaise with feeder primary schools to ensure that all relevant information is shared. Subject teacher and form tutor feedback. Additionally, referrals are made to the Head of School and SENDCo in cases where pupils do not seem to be making the expected level of progress or when parental concerns have been raised. Identification criteria for SEND will be used in discussion with the Head of School, SENDCo and the Specialist Assessor who may use further psychometric tests to explore the possibility of specific weaknesses and to see if a pupil qualifies for examination access arrangements. Parents and pupils are consulted whenever there is a concern regarding progress. How is the decision made about how much support my child will need? Provision is regularly reviewed and adjusted to meet the changing needs of our pupils. We wish to encourage independent learning skills, and to avoid over-reliance on additional adult support. We are guided by the objectives on Education, Health and Care Plans (EHCPs) / statements but place much greater emphasis on providing effective support that focuses on progress towards agreed outcomes, rather than using a specified number of teaching assistant 'hours' ineffectively. Teaching staff provide projected performance grades for pupils on a termly basis. This ensures that there is always relevant and up to date information on the academic level that is currently being achieved by each pupil. In addition to this, students who have SEP Plans have their targets and progress monitored termly by the SENDCo, Heads of School, subject teachers and their mentors. Mentors meet with their students regularly to ensure that their views on how they feel they are progressing are understood. How will I know how my child is doing and how will I be involved in discussions about planning for my child's education? In addition to interim and end of year reports, and a parents' evening, information about the progress of pupils towards agreed targets (projected grades) is shared with parents termly. 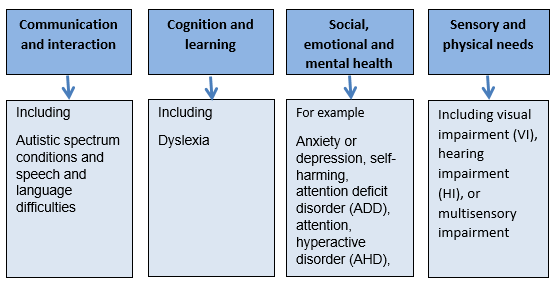 For pupils with an Education, Health and Care Plan (EHCP) or Statement of Special Educational Need, the SENDCo or a specified teaching assistant will be the main contact with parents, and regular review meetings, including the formal Annual Review, will be arranged with the pupil and parents, and sometimes outside agencies, to discuss progress and plan provision. For students receiving Special Educational Provision (SEP) within the school, the SENDCo or Head of School will be the main contact with parents. A Special Educational Provision Plan will be developed to share information about the student with teaching and support staff, and parents. The SEND department has an â€˜open door policy' and parents are invited to contact school should they wish to discuss their child's progress throughout the year. We value regular, informal communication with parents. How will the school prepare for and support my child joining the school? A structured transition programme is in place for all Year 6 students. Additionally, the SENDCo, Mr Mills, will also visit all pupils with a statement / Education and Health Care Plan in their primary school prior to them joining the school, to discuss the transition. Where possible the SENDCo will also attend the last annual review meeting. In addition, before your child comes to the school they will have the opportunity to attend Master Classes in the summer term with an opportunity to meet teachers and teaching assistants. All children will be invited to attend an Induction Day in July but children with special needs will have the opportunity for further visits or discussions with the SENDCo and other staff. Parents are encouraged to contact the school should they have any further queries. Parents are invited to discuss with the SENDCo how the pupil's transition into the school can be supported. Appropriate contacts will be made with the previous secondary school. Pupils with special needs are very welcome to join the school providing they meet the school's sixth form entry requirements. Please contact the Head of Sixth Form, Mrs N Daniels, or SENDCo, for further details. Pupils are encouraged to visit a number of times prior to induction. How will the school prepare and support my child as they move within key stages? At the beginning of each academic year, information about your child's needs and strategies to support him/her is given to all of his/her new teachers, form tutor and Head of School. You and your child are able to take part in all the transition arrangements for Year 8 students taking up their GCSE courses in Y9 (e.g.Y8 Options Evening and an Introduction to GCSEs Parents Evening at the beginning of Y9). There are also information evenings for each year group. Your child's option choices can also be discussed with the form tutor, Head of School or the SENDCo. There is also the opportunity for careers advice from Mrs Fox. Pupils with an EHCP/Statement will also fill in a transition plan which will be reviewed annually. Pupils with SEND are closely supported before they join our sixth form especially over their choice of the most appropriate courses. They also have the opportunity for further visits to the sixth form environment as well as the chance to discuss and review levels of support. How does the school support my child/young person to transfer to the next stage of education and life? We work closely with Lincolnshire County Council and post 18 learning providers to ensure that pupils are prepared for the next stage of their education. Further support will be provided to help students in their transition to college, university or training. Mrs Daniels, Head of Sixth Form, Mrs Hull Specialist Assessor and Mr Mills SENDCo work with parents and students to ensure universities are aware of any additional needs, and offer detailed guidance on the filling in of UCAS forms. What provision is there for students with Special and Additional Educational Needs, including how the curriculum will be matched to my child's needs? The school aims to ensure the fullest possible access to the curriculum for all pupils with Special Educational Needs, with an emphasis on keeping students in the classroom to learn alongside their peers, rather than withdrawing them for additional programmes. In many cases, the subject teacher can support individuals at a level appropriate to their needs through effective differentiation in the classroom and the use of generic strategies for pupils with identified needs. All staff are trained in strategies to support autism, dyslexia and hearing impairment. Linking to SEND Code of Practice 2014 there is a staged and graduated approach to identify and assess needs using the 'Assess, Plan, Do, Review' model. The triggers for further intervention could be either parental or pupil concern, underpinned by evidence about a pupil who, despite receiving differentiated learning opportunities with the support of the SENDCo and high quality teaching is not making the expected progress. Pupils may receive key strategies to be used by all subject teachers. Some pupils may require a Special Educational Provision Plan (SEP), along with targets, specific provision and expected outcomes, planned by teachers and supported by the SENDCo. It will include advice for teachers on how they can support your child in class and will be shared with you, your child's teachers, form tutor and Head of School. The pupil and parents will be involved in the planning and termly review of this Plan. Provision may involve enhanced adult support or teacher-led interventions, depending on the nature of the provision and level of difficulty. Where specific provision and / or TA support is implemented, regular communication with parents will be encouraged to ensure that strategies are supported and reinforced, where appropriate, at home. The student will also meet with a mentor on a termly, or more regular, basis. Access to netbooks and laptops and adaptable mouse. What else will the school do to support my child? Mr Mills SENDCo works with Mrs Hull (Specialist assessor) to see whether your child may be entitled to further support through additional access arrangements. All pupils have the opportunity to attend Home Learning Club which is run by Mr Mills SENDCo on a Tuesday to Thursday until 5.15. There is opportunity for further support with tasks and to liaise directly with subject teachers for additional support. How are 'Looked after' pupils supported? All 'Looked after' pupils have specific needs, though not all may have special educational needs. Where these are identified they will be supported by the normal SEND processes. There is a separate 'Looked after' pupil policy with an identified teacher (Mr Felton Head of Lower School) who is responsible for monitoring the progress of 'Looked after' pupils. Every reasonable adjustment is taken to make provision for pupils with disabilities defined by the Equality Act 2010. Almost all classrooms are accessible by wheelchair or to pupils with restricted mobility. A lift gives access to upstairs classrooms (including the Science and Languages block) and ramps are available to enter and exit the buildings. When a room is not accessible, alternative arrangements are made. There are disabled access toilets, wide corridors and access to equipment which supports learning. .
What expertise for students with SEND is available within - or accessible to - the school? Who will support my child in school and what training and expertise do they have? Every member of staff in school has a responsibility to support all students effectively. Your child's form tutor and Head of School provide pastoral support. A number of our teaching assistants including the SENDCo are trained teachers If appropriate, your child may also be supported by a senior pupil. All activities and school trips are inclusive in nature; if your child wishes to attend a school trip, they may need some additional support with this. Comprehensive risk assessments are carried out prior to a trip. The school's educational visits coordinator meets with the SENDCo in the early planning stages of any trip to discuss possible difficulties for pupils. We ensure that all reasonable adjustments are made, including additional staffing or alternative travel arrangements, to allow all pupils to participate as fully as possible in the activities. Any potential barriers are discussed with parents. All of our extra-curricular activities and school visits are available to all our pupils, including our after school clubs. All pupils with special needs are encouraged to go on residential trips and they have participated successfully, for example, in visits to Malham, Iceland and the Sydney Study Tour to Australia. All pupils, including those with special needs, are encouraged to take part in whole school activities such as sports day, school plays (for example the current production of Beauty and the Beast), enrichment programmes and charity activities. Pupils with SEND involved in these activities have the opportunity to have further meetings with the teacher and SENDCo to discuss any further concerns they have on a 1:1 basis. They are also provided with a detailed itinerary/routine of each day. Parents are encouraged to attend these further discussions and to email concerns to teacher or SENDCo. What support is available in the school to improve emotional and social development? There is a structured programme within Tutorial lessons that covers these areas, and all pupils are supported by form tutors, their head of school, the headteacher, the anti-bullying committee (run by sixth form students) and anti-bullying reps in every form group. Furthermore, students with SEND have mentors with whom they meet regularly. Where appropriate, referrals are made to Healthy Minds and CAMHS and mentoring is provided by someone with whom the pupil feels comfortable. Who are the key external partners involved with the school in supporting pupils with special needs? When support is needed, this is accessed directly by the school, or through the setting up of a multi-agency team. Parents can access support and information independently through the school website. What is the Lincolnshire Local Offer? This is the resource that is available to support pupils with special needs and parents from the local authority. It is available online at the Family Service Directory but you can also contact either the Family Information Service or Information, Advice and Support Service and they will help you find what you need, or if you need additional support with the website. What medical support is available in school? There are trained first aiders and all staff are trained to support students with chronic illnesses with regular contact with parents being maintained. Check your child's planner (available for Y7 & Y8) regularly and /or access our App â€˜QEGS Anywhere' and the intranet. Attend all parents' evening and SEND review meetings as requested. Support your child with their home learning if needed. Inform us of any changes regarding your child's family or personal circumstances. How can I access additional support for myself and my family? We can direct parents to other appropriate support groups and agencies if you need this. You will also be referred the school's Complaints Policy. (Link)The parents of pupils with disabilities have the right to make disability discrimination claims to the first-tier SEND tribunal if they believe that our school has discriminated against their children. How is the effectiveness of SEND policy outlined in this Information Report evaluated? Special educational provision is reviewed every year by the SENDCo and Headteacher to ensure it effectively addresses the needs of current pupils and allows them to achieve their academic targets and wider intended outcomes. This is reported to governors on an annual basis. The performance of SEND pupils in public examinations is evaluated by the SENDCo each year and discussed with the Headteacher. The views of parents will be gathered about the effectiveness of aspects of the policy at reviews and other meetings with parents. This policy will be updated and reviewed again in January 2019 and parents will be consulted about the format and content.